As the stars say - it was ok. 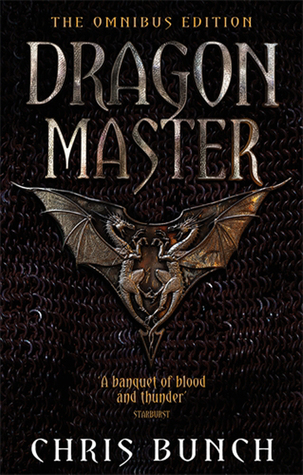 The first book had to be plodded through, the second was better than the first, and the third is the only book that has at least 50% of it on dragons. Also, there was too much war in it to my taste. By far my favorite book. Is the only book I've ever read at least 3 times through. I love the way it follows Hal from before the war straight through it and even after. The fact that the Dragons are terrifing beasts that don't talk but are tamed at the owners own risk. Brilliant. Third time reading this book.. always loved the first two, didn't really like the third. Until now.. now I like all three - weird. I don't know if the Omnibus edition was re-edited, but I won't be spending the money on the separate editions to find out. Very thinly sketched characters - only Hal has any real background outlined at the beginning.Later, a lot of unexplained inspirations occur to Hal, but it takes hundreds of pages before he thinks to travel West (or wait, was that East, or North, or South? The compass points seem to vary with each paragraph, as if Mr Bunch was feeling a bit dizzy) and follow the trail of wounded dragons.Several plot opportunities (that were not followed up, just fizzled out) later and you get a pretty flat termination to a fairly hefty tome. (Telepathy with dragons, potential parallel worlds, completely unexplained giant demon seemingly easily dispatched. )It was almost as if it is a huge set of almost-complete notes, the story outline if you will, rather than a finished story with added depth. Or maybe it is just me not getting the point. I did wonder if it was meant as a bleak discourse on the pointlessness of most wars, or the continual expansion of the human species, but it lacked depth of comment on this angle as well - if it was even meant to be there.Despite these fairly negative thoughts, I still found enough energy to finish it, so it can't have been all bad. This isn't completely bad but quite bad & in parts it was SO bad I really can't enjoy the better parts of it. The protagonist is AWFUL. Quite often his actions & motivations are not comprehensible & he somehow remains boring throughout the whole trilogy. Overall, the characters lack depth & are often unconvincingly described or built up. The last book of the trilogy seems completely random to me & as if he just wrote it so it would be 3 & not 2 books. His particular style, meaning often concatenating several sentences by putting commas, put me off a LOT. On the other hand, the battles are done in a solid enough fashion & some of the characters are kind of likeable - the wizards & the king I found rather interesting. Fantastic book. Seriously. It's brilliant. Not because of the writing, which is good, but nothing special. No, it's brilliant because it takes established ideas and slams them into reality. Want a big motherfucking flying lizard? That's cool, but like everything that can fly, it's going to be pretty flimsy in a fight. The dragonriders of this book are what they really would be. And it's awesome to see the medieval/world war one trench warfare that they take part in. The characters are well developed, and interesting. And they die. Thank god they die. There's nothing worse than a book about war where only the unimportant die. Chris Bunch - Christopher R. "Chris" Bunch was an American science fiction, fantasy and television writer, who wrote and co-wrote about thirty novels.Born in Fresno, California, he collaborated with Allan Cole on a series of books involving a hero named Sten in a galactic empire. (Cole married Bunch's sister, Kathryn.) He served in Vietnam as a patrol commander. He also wrote for Rolling Stone and was a correspondent for Stars and Stripes. He died in his hometown of Ilwaco, Washington, after a long battle with a lung ailment.